[34% OFF] 2019 Striped Cami Belted Shorts Set In CHESTNUT RED | ZAFUL ..
Súper lindo, Cómodo y de material fantástico y se ve exactamente como las fotos. Yo solo tuve un pequeño problema, mi conjunto llegó sin el cinturon de tela. The top is very nice and stays on well. I bought a size S and I’m 158cm and weigh 43kg, and it fits me well. The shorts are a bit big and look a bit weird but I still think they look good together with the top. It took 16 business days to arrive to Northern Europe after I created the order. 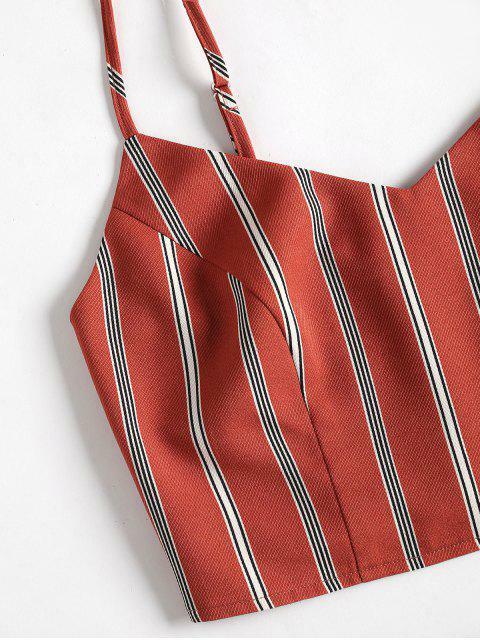 A charming top and shorts set from Zaful that are tailor-made for summer adventures, from the striped cami cropped top with smocking back, to the relaxed, high-waisted belted shorts with an elastic style.